Snowfall began at about 4 am in the morning and continued for the entire day, enveloping many parts of Rudraprayag district in a blanket of white. The reconstruction work at Kedarnath was affected as many parts of Uttarakhand received heavy snowfall on Saturday. Snowfall began at about 4 am in the morning and continued for the entire day, enveloping many parts of Rudraprayag district in a blanket of white. The team tasked with the reconstruction of the famed temple were forced to stay indoors as continuous snowfall brought the mercury down. 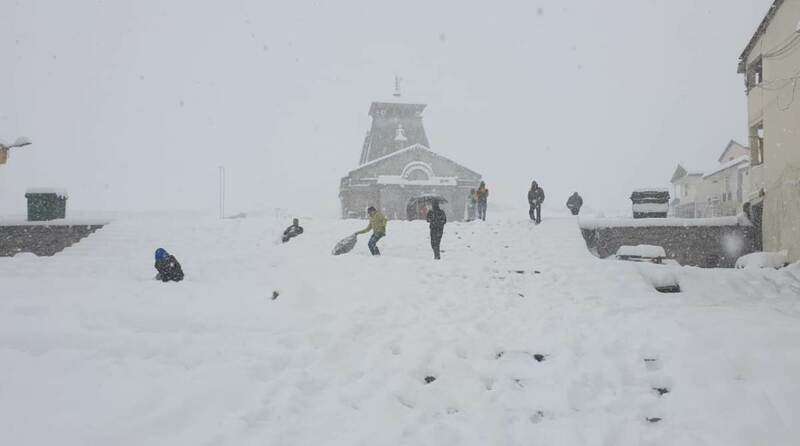 Kedarnath received heaviest snowfall of this season and most of the places were covered under one feet snow. Reports also say that around four inches of snow covered Badrinath, Yamunotri and Gangotri. Kedarnath is in news these days due to the proposed visit of Prime Minister Narendra Modi. The PM is expected to visit the pilgrimage town next week. The state government has started preparation work for the visit and heavy snowfall has created worries for the administration. But helicopter services in Kedarnath might be stopped if the weather situation remains unchanged till 6 November. According to reports, if the weather remains unfavourable, the PM may have to reschedule his visit. The Metrological Department has predicted light rainfall and snowfall in high reaches of Uttarakhand in the next 24 hours. Temperatures dipped in Dehradun, Mussoorie, Tihri, Uttarkashim Chamoli, Pithoragarh and Almora after rainfall on Friday night. People were seen wearing winter clothing to beat the chill that has set in these parts of the state.